Food guarding is the term given to the habit some pets have of being aggressive or defensive when eating their food, or chewing on a bone or a toy. This is also known as food aggression. While the exact cause of food guarding has not been determined, one theory suggests that puppies fed from a communal bowl pre-disposes dogs to developing food guarding behavior. Signs of food guarding range from very mild, such as growling or running away with the food, to severe cases where biting occurs. Many pet parents elect to not treat mild food guarding and instead make sure the dog is left alone while eating, or they use a door, baby gate or kennel to separate the dog from people or other pets during meal time. The best way to deal with food guarding is to prevent it in the first place with a puppy or dog that doesn’t yet guard the food bowl. 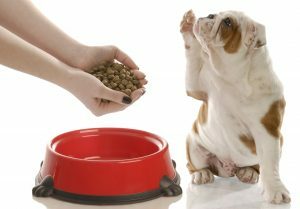 In this scenario, when you bring your new dog home, you should hand feed the first few meals to your dog, making the experience as calm and positive as possible. The next level of training must consist of building a positive association between people approaching the food bowl and something really good happening, like a treat getting dropped in the bowl. While your dog is eating, casually drop in a tasty treat, like a small piece of cheese or deli meat. Make sure to do this at least once or twice a meal until your dog seems comfortable and happy to have you around while he eats. If he shows any signs of discomfort or nervousness, stop and try again later. Signs of stress in a food-aggressive dog include food gulping, a stiffened body, raised hackles, growling, snapping, staring, panting or widened eyes. Animal behaviourists used to tell pet parents that to prevent food guarding, they must take the food bowl away over and over again while a dog’s eating and mess with a dog while he’s eating to get the dog ‘used to’ being messed with while eating. This practice is outdated, potentially dangerous and no longer recom- mended. Nobody likes to be messed with while they eat, including dogs! 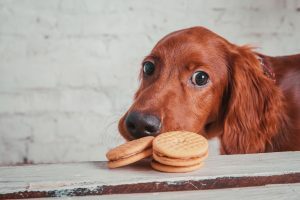 If the dog bites while food guarding, or if there are children in the home, then the risk of not treating food guarding is too high. Do not attempt to resolve food guarding on your own. If you wish to keep the dog in your home, then it’s time to talk with either a certified animal behaviourist or your veterinarian. Every dog deserves to be understood, and he/she is relying on you – the person he loves most in the world – for help.